When a application or process is developed, the main requirement would be quite simple or might look simple. 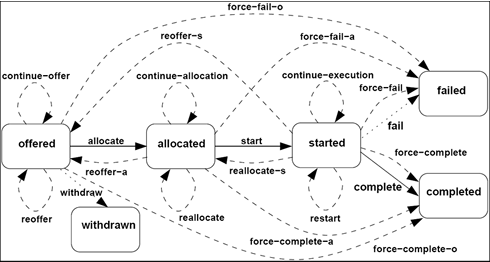 But have a look at the below diagram which shows a process which is part of an application (courtesy: workflowpatterns). The solid lines (which are only 3) indicate the normal state through which the execution will flow. We could accomplish this normal flow with some programming knowledge and some technical skills. But the tricky part is the flow indicated using dotted lines. There are 17 of them! These will not be considered during most of the discussions with the business owner. Many of them might be even missed during design and implementation. But they are important for sure. These dotted flows make the application fail proof and allows the support team to maintain the application without nightmares. If you think you can develop an application within a few days, then you are surely not considering these dotted lines, as this is the part which takes more time during the development and testing cycle. If you don't want to get stuck with maintaining the application for long and don't want to have sleepless nights on production issues, then consider all possible dotted lines (in other words the Non-Happy paths) for your application. Also make sure you let your business owners know the importance of handling all exception scenarios. This might take a little longer for your application to go live, but it will stay live for longer.